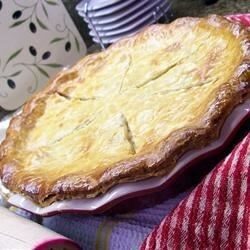 "This recipe can be made in small individual size pie pans or in a large pie pan as well. This can also be prepared in advance and frozen once assembled and baked later." Preheat oven to 400 degrees F (200 degrees C). Line bottom of pie pan with crust. In a skillet saute the chopped onion until slightly soft and set aside. Mix together the turkey or chicken, mixed vegetables, onion, soup and milk. Pour into pie crust, cover with top crust and crimp edges. See how to turn leftovers into a super-simple pot pie. This is a good "start" but needs more spices to suit me. Overall....too bland and boring for us. I added for spices: 1/2 tsp each of salt and pepper and 1 tsp poulty seasoning.